Inspector Winter - BUY THIS DVD! 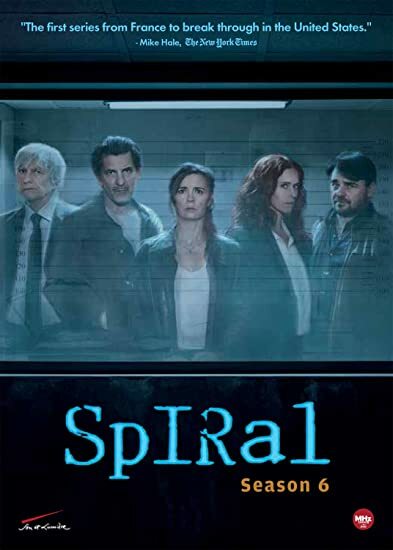 Originally released in France as Engrenages, the hard-hitting Parisian cop thriller Spiral became a blockbuster sensation across all of Europe and Australia, winning awards and commendations from TV France, The Royal Television Society in the UK, and from The Academy of Television Arts and Sciences in the US. Fans around the world embraced its compelling story and naturalistic style, which even spawned a popular video game. Spiral Season 6 begins with the shocking discovery of a dismembered human torso in a pile of garbage in the 20th arrondissement in Paris. Police Captain Laure Berthaud returns from maternity leave to reunite with her colleagues Gilou and Tintin, and together they tackle the complex investigation. The trail leads them to a northern suburb where Laure's mentor Commissioner Herville was transferred, and where the team will face off against institutional corruption and organized crime in a neighborhood devastated by poverty and delinquency. Meanwhile, a high-profile criminal trial tempts lawyer Joséphine Karlsson, and Judge Roban faces a rapidly escalating health crisis. This new season pushes every character to their limit and forces them all to question long-standing affiliations and beliefs. THEN SEND IN YOUR NAME, ADDRESS AND 5 COMMENTS TO contests@efilmcritic.com. Put "GETTING DIZZY AFTER SIX YEARS" in the subject line and cross your fingers. We will draw names and a winner shall receive a prize package. Only 1 entry per household.